Annie Edson Taylor’s life had its ups and downs. But at the age when most people were resigned to rocking on the front porch, circumstances in her life pushed her over the edge, literally. One of eight children born in New York, her father, Samuel Edson, owned a flour mill which generated enough income to leave a comfortable living for the family after his death, when Taylor was only twelve years old. Taylor came of age in an era when women didn’t have many options, so she graduated (with honors) from a teacher training course. While in school, she met David Taylor. She was seventeen when they married, and not long afterwards they had a son who died in infancy. Her troubles were compounded when her husband was mortally wounded in the Civil War. At twenty-five years old Taylor was a widow with her whole life ahead of her. Taylor couldn’t seem to settle down, so, with her teaching to fall back on and a strong sense of wanderlust, she tried out various jobs in several different cities. A woman of many talents, when she hit Bay City, Michigan, she decided to teach dance. Never mind there were no dance schools, she opened her own. When she tired of that, she landed in Sault Ste. Marie to teach music. After a while, she pulled up stakes once again and went with a friend to San Antonio, Texas, the jumping off point for an adventure in Mexico City. In 1900, when work didn’t pan out there, she headed back to Bay City. By now she had exceeded the life expectancy for women by about 10 years. She had run out of money, and at 62 years old, she knew she needed to do something to make her future financially secure. She read an article about the Pan American Exposition in Buffalo, New York and how those who were attending the expo were also flocking to see Niagara Falls. 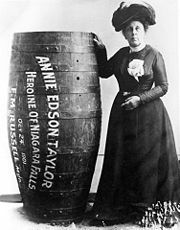 That’s when the idea for her get-rich-quick scheme came to her in a flash, something that no one (man or woman) had ever done before: go over Niagara Falls in a barrel. She was banking not only on surviving the experience, but that she would earn lots of money from telling her story. Taylor’s mode of transportation would be a custom-built oak and iron barrel lined with a mattress and leather harness to secure her arms. The barrel was four and a half feet high and three feet in diameter with a blacksmith’s anvil secured in the bottom to keep the barrel upright. Not everyone was on board with her adventure. There were several delays in the completion of the barrel because many people wanted to distance themselves from a potential suicide. Taylor was confronted by a reporter asking if she was suicidal. She replied that she was a good Episcopalian, believed in a Supreme Being, and was aware that self destruction held consequences in the afterlife. Finally, as a safety measure, Taylor was convinced to let a cat go over the falls in the barrel on a test run. When the cat survived the fall, it was all systems go. On October 24, 1901, Taylor celebrated her 63rd birthday not with cake and ice cream, but with the ride of a lifetime. At a point south of Goat Island near the American shore, she climbed from a row boat into the barrel with her lucky heart-shaped pillow. Her conspirators sealed the lid, pumped air in through a hole which they plugged with a cork, and gave her a push. Thanks to her promoter, there were thousands of people watching the barrel drift down the river, tumble over the falls and plunge into the deep water. The suspense lasted about twenty minutes when the barrel popped up and finally drifted close enough to shore to be recovered. Taylor admitted to losing consciousness when she dropped over the falls, but the only injury she sustained was a cut on her head and the effects of shock. Since there were no reality TV shows to star in (or no television for that matter), in order to cash in on her feat, Taylor recounted her experience in lectures and posed for photos at a souvenir stand. Her manager took off with her barrel, and most of her money was spent trying to reclaim it, which she never did. For all her efforts, Taylor died destitute 20 years later, but she held the record of being the only person to go over the falls for ten years. She is buried in the “Stunters Section” of the Oakwood Cemetery in Niagara Falls, New York. QUESTION: What is the most daring thing you or someone you know has ever done? Was it a positive experience?